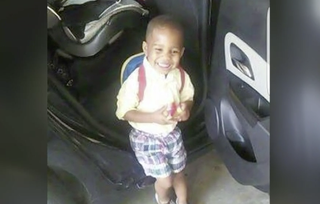 The 911 tapes released after the horrific shooting death of 3-year-old Acen King in Little Rock, Ark., over the weekend reveal his grandmother's pain as she and a bystander tried to get help for the little boy, Raw Story reports. According to the report, a woman at a J.C. Penney store that the grandmother had driven to called 911 on behalf of Acen's grandmother Kim King-Macon. King-Macon's screams can be heard over the phone. "Acen has been shot," she can be heard wailing. "Oh my God!" The woman on the call described how King-Macon was trying to perform CPR on the little boy. When the woman tried to get information from King-Macon about what happened, she responded clearly, "I was at the stop sign and the guy blew the horn at me and I blew it back and he shot. But I thought he shot in the air. He shot in the car!" Little Acen was shot in the neck and later died at the hospital. According to CNN, police are still searching for the gunman who fired the fatal shot and are offering a $40,000 reward for information leading to an arrest and conviction, doubling it from the $20,000 that was originally offered. NBC News notes that the city announced a $20,000 reward Sunday, with the FBI following up on Tuesday with a $20,000 reward as well. Authorities are seeking a man driving an older-model, black Chevrolet Impala. The incident started Saturday evening when a motorist pulled up behind the grandmother and apparently thought she was not moving quickly enough through a stop sign. The man honked his horn, and the grandmother honked back. The man then got out of his car and fired into her car, striking the little boy. "One shot was fired and it went through the vehicle and hit the child," Little Rock Police Lt. Steven McClanahan said, according to CNN. King-Macon did not realize that her grandson had been hit and drove to the J.C. Penney about 9 miles away. It was there, while trying to get the child out of the car, that she realized something was very wrong.